Necklaces There are 16 jewelry. Necklace and pendant with a beautiful Arabic mosaic in shades of yellow, green and red.This jewelry is made by Miss Cabochon in France in his studio.The pendant will be provided with a chain of the length of your choice (between 40 and 55 cm). 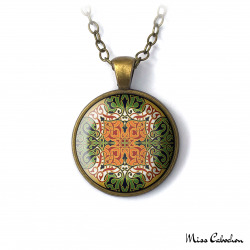 Necklace and pendant with motifs inspired by certain ceramics of the 18th century.This jewelry is made by Miss Cabochon in France in his studio.The pendant will be provided with a chain of the length of your choice (between 40 and 55 cm). Necklace and pendant patterned in blue tones characteristic of the arts of Islam.This jewelry is made by Miss Cabochon in France in his studio.The pendant will be provided with a chain of the length of your choice (between 40 and 55 cm). Necklace and pendant with blue and yellow floral motifs and lily flowers.This jewelry is made by Miss Cabochon in France in his studio.The pendant will be provided with a chain of the length of your choice (between 40 and 55 cm). Necklace and pendant from the Orient in shades of blue and red.This jewelry is made by Miss Cabochon in France in his studio.The pendant will be provided with a chain of the length of your choice (between 40 and 55 cm). Necklace and pendant with beautiful arabesques in shades of green and orange.This jewelry is made by Miss Cabochon in France in his studio.The pendant will be provided with a chain of the length of your choice (between 40 and 55 cm). Necklace and pendant with a beautiful mosaic of oriental style.This jewelry is made by Miss Cabochon in France in his studio.The pendant will be provided with a chain of the length of your choice (between 40 and 55 cm). Necklace and pendant with arab and hispanic designs.This jewelry is made by Miss Cabochon in France in his studio.The pendant will be provided with a chain of the length of your choice (between 40 and 55 cm). Necklace and pendant with green, blue and red floral motifs on a beautiful beige background.This jewelry is made by Miss Cabochon in France in his studio.The pendant will be provided with a chain of the length of your choice (between 40 and 55 cm). Necklace and pendant with a beautiful celtic cross in shades of blue, green and yellow.This jewelry is made by Miss Cabochon in France in his studio.The pendant will be provided with a chain of the length of your choice (between 40 and 55 cm). Necklace and pendant with pretty geometric and floral motifs on a blue background.This jewelry is made by Miss Cabochon in France in his studio.The pendant will be provided with a chain of the length of your choice (between 40 and 55 cm). Necklace and pendant with pretty floral patterns in shades of yellow and blue surrounded by a white frieze on a burgundy background.This jewelry is made by Miss Cabochon in France in his studio.The pendant will be provided with a chain of the length of your choice (between 40 and 55 cm). Necklace and pendant with beautiful persian patterns.This jewelry is made by Miss Cabochon in France in his studio.The pendant will be provided with a chain of the length of your choice (between 40 and 55 cm). Necklace and pendant with beautiful blue and yellow arabesques.This jewelry is made by Miss Cabochon in France in his studio.The pendant will be provided with a chain of the length of your choice (between 40 and 55 cm). Necklace and pendant with blue and yellow patterns from the East.This jewelry is made by Miss Cabochon in France in his studio.The pendant will be provided with a chain of the length of your choice (between 40 and 55 cm). Necklace and pendant in oriental style inspired by Moroccan crafts.This jewelry is made by Miss Cabochon in France in his studio.The pendant will be provided with a chain of the length of your choice (between 40 and 55 cm).